Please note that I have not been paid to review any of these places. Its entirely based on my experience. I am back to my normal routine after a very hectic trip to Mumbai. We had made plans to actually see Mumbai this time and not spend all our time in Juhu and Vile Parle which we normally do. However God had other plans in store for us. The trip started off on a very hectic note, with our baggage not arriving with us in Mumbai. The Ethiopian Airline ground staff is probably not trained well enough to handle situations when more than 100 passengers do not get their baggage. The staff could not get the tired and irritated passengers to queue, didn’t have the presence of mind to deal with passengers who had connecting flights and didn’t have the claim forms ready. The lady sitting comfortably at the desk, disappeared as soon as passengers began to complain!Ethiopian Airline has trained their staff very well in the disappearing act, whether it be at the Mumbai, Mombasa or Addis Ababa airport. Within the first week of landing in Mumbai we were busy trying to get our luggage back, preparing for my daughter’s engagement and going through a pile of paper work as we had just sold our Mumbai flat. 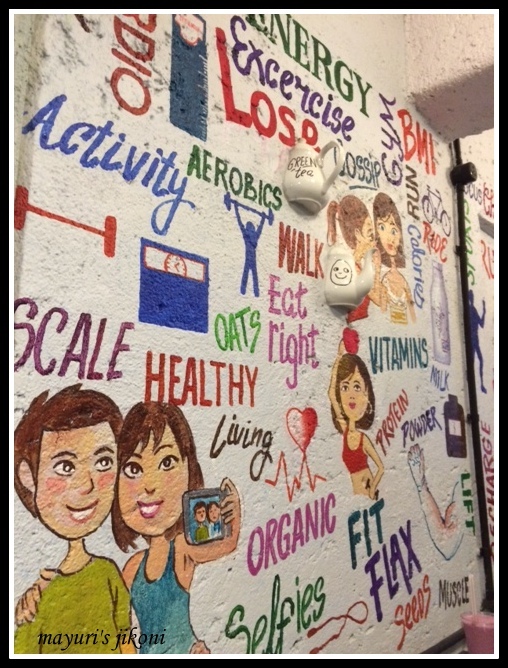 A lot of our work was done in the Juhu area which is amazing. No one can ever match the service that one gets in India. We stayed at the ISKCON temple in Juhu and were able to, not only repair our suitcase but buy a new one too all in the Juhu area. Would I like to live in the Juhu area for a long term? Probably not unless the apartment is in the quieter part of Juhu. The area around the temple has become just too busy and its difficult to find space to walk there. However all the services from photocopying, buying a sim card, lawyer, beauty salons are all at walkable distances. 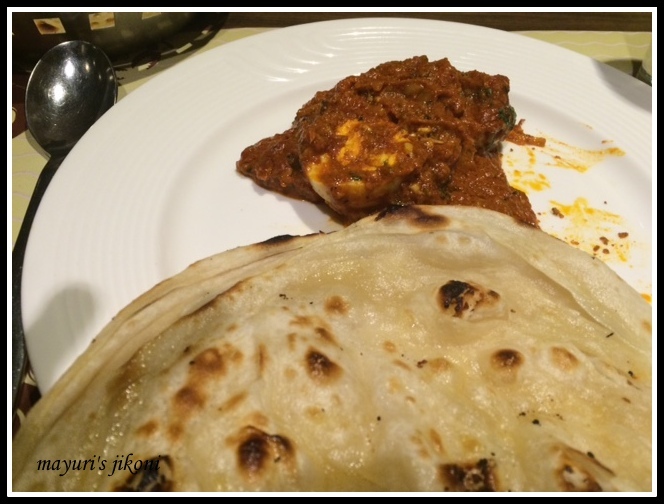 Since we spent nearly 3 weeks just in Juhu and Vile Parle area, its only fair that as a food blogger I mention a few eateries that are in Juhu. You really cannot miss Govinda Restaurant at the ISKCON Temple. Lunch and Dinners are pure vegetarian buffets that caters for all tastes. They serve Indian, Indo Chinese, Italian and Mexican food. Varieties of juices, curries, breads and desserts are served everyday. It’s simply not possible to sample all that is served in one sitting. You need to go again to try out the what you missed last time. The temple also runs a very busy snack bar behind the main temple area. Again, it has a variety of snacks right from pizza to chaats. They run a successful bakery and their breads are soft, not sweet and yummy. Just as you come out of the main gate of the temple, there are a few very tiny eateries on the opposite right side. Don’t be mistaken by the size of these places. They serve good and delicious food. 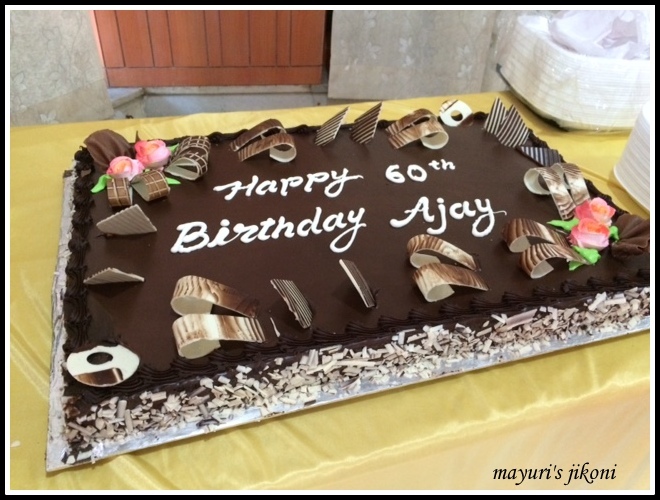 We ordered my hubby’s 60th birthday cake from Birdy’s, a chocolate cake. The cake was soft, delicious and eggless. 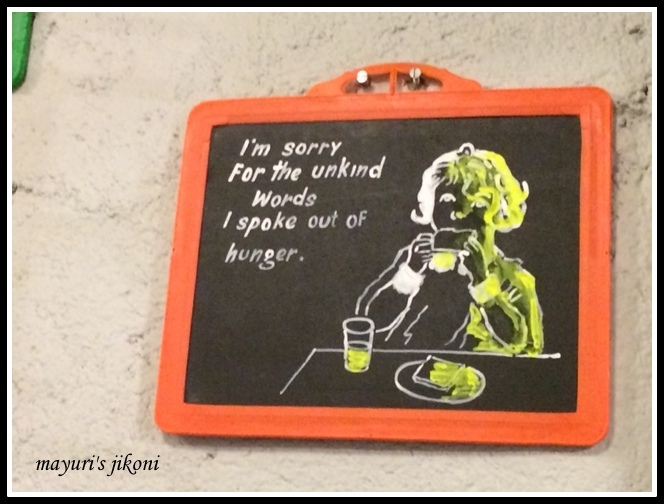 I have had snacks from Birdy’s during my previous visits and have loved them. However, they do not have a place to sit. So either take the snack home or stand in the shop and eat it! 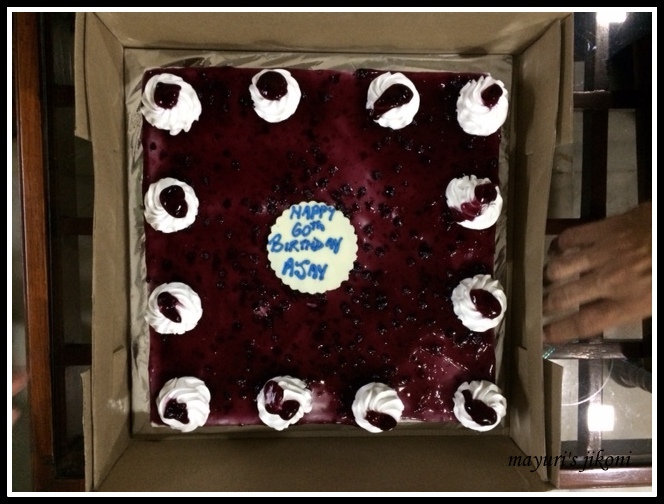 We ordered blueberry cheesecake from J’adore to celebrate hubby’s birthday on the actual day… Christmas Day. The cheesecake was refreshing, not too sweet and fresh. I had tasted the pineapple cake and that too was a treat. Pishu’s is a new eatery. Its tiny but quaint and serves the freshest food ever. 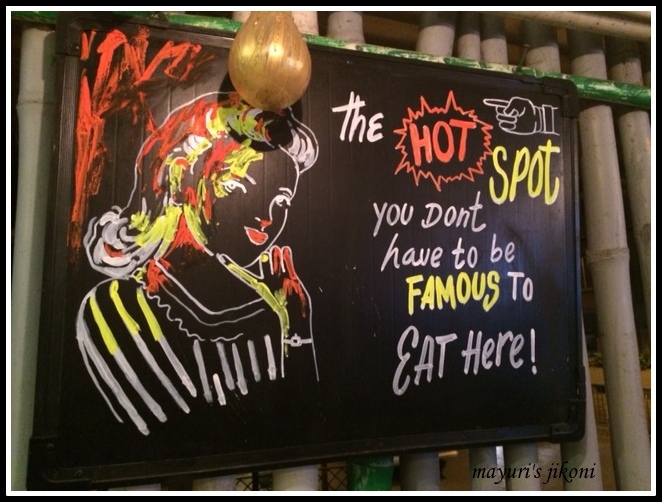 The staff are really friendly, an arty ambiance and a comfortable place. Fresh and healthy juices, smoothies, snacks and the classic maggi noodles. 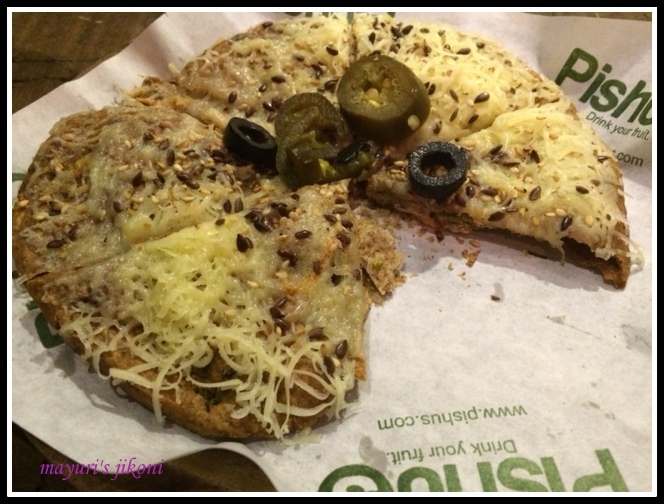 The servings are just enough and they make the most unusual crunchy base for their pizzas. Its a multigrain base and amazing. I love the size of the pizza, just right so you really don’t have to share it with anyone. We all have come down with coughs and colds. Whenever any one of us required a satisfying meal we would head to Pishu’s. My nephew and brother in law loved the fresh seasonal juices. I enjoyed the fresh strawberry milkshake. A mug of hot soup and a pizza was enough to ward off our cold. After a long walk on the beach, spinach or mushroom pasta was a very welcome hot meal for hubby and me. I was not particularly impressed with the brownie milkshake as it was just too sweet. Adding a brownie and ice cream does not make it healthy at all. 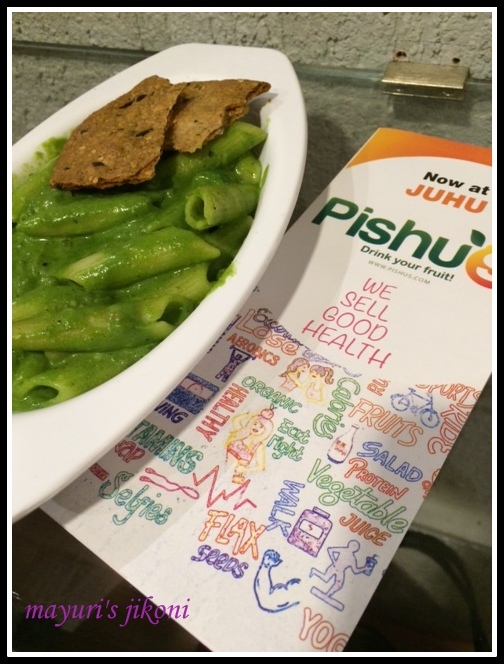 Pishu’s tries to concentrate on the health factor… fresh, nutritious and wholesome meals. The prices too are very pocket friendly. Do try out the eatery and don’t be put off by the size of the place. Magic is created in that tiny kitchen behind the counter. Proof of freshness? Hubby and I had ordered orange and pomegranate juice. My orange juice arrived and hubby’s pomegranate juice hadn’t. After a while I asked the waiter if he had forgotten the order. He replied that he hadn’t but it takes a while to remove the seeds from the pomegranate.Feeling a bit peckish at 12 midnight, we went to Pishu’s and ordered soup. Much to our surprise it was not a packet affair like most restaurants. The mushroom soup was freshly prepared in the most unique way. 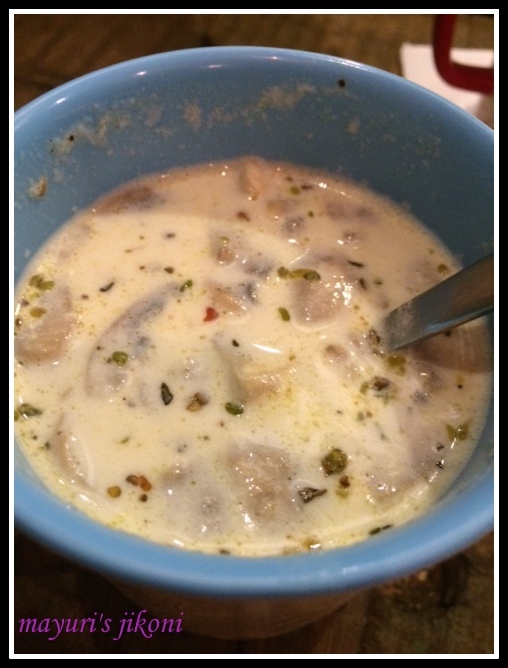 They added herbs, chilli flakes and mushrooms to milk and voila a delicious healthy soup was served in no time along with the crunchy pizza base. Hubby and I smiled and learnt to wait patiently for our food next time we went there. Did I mention its a vegetarian place? Well it is and hope its still there when I go to Mumbai next. Dakshinayan is our other favourite haunt. 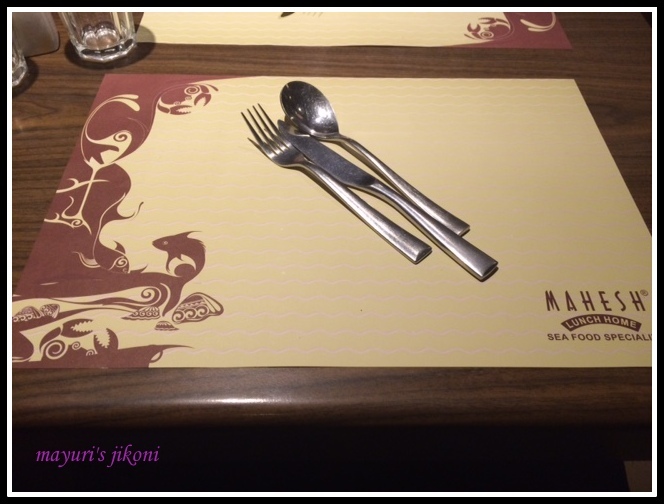 Its serves South Indian Cuisine. Love the variety of dosas right from the normal ones to ragi ones. Though must admit the ragi one tasted like the normal rice lentil fare. Ambassador idlis, mini idlis, kanchipuram idlis, lemon rice, tamarind rice. etc etc.No one walks out hungry from this place. 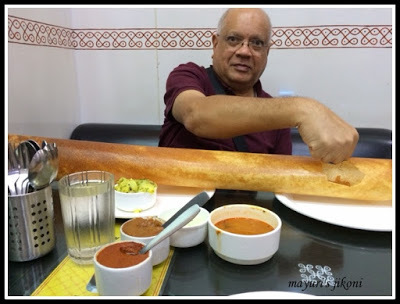 If you go with someone who doesn’t like dosas and idlis they can order puri bhaji. The kulfis are a must have item on their menu. Be prepared to wait as they do not book tables in advance and this place is busy even during week days be it lunch or dinner time. 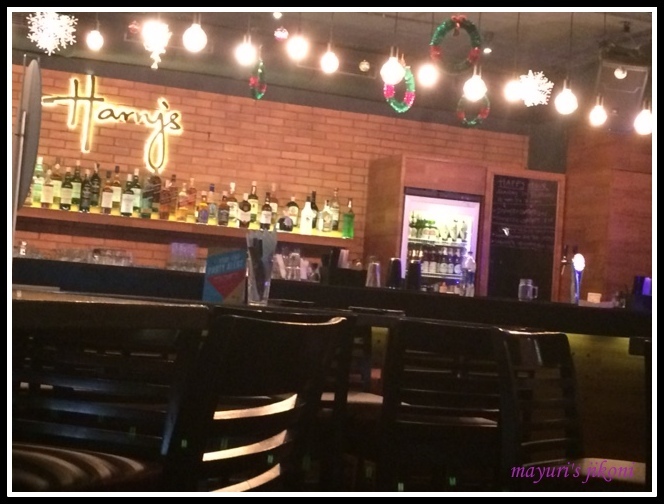 A new discovery was Harry’s Pub which is opposite the Post Office next to Sanjay Khan’s house. The veg platter we had for lunch was delicious and just right to have a light meal. 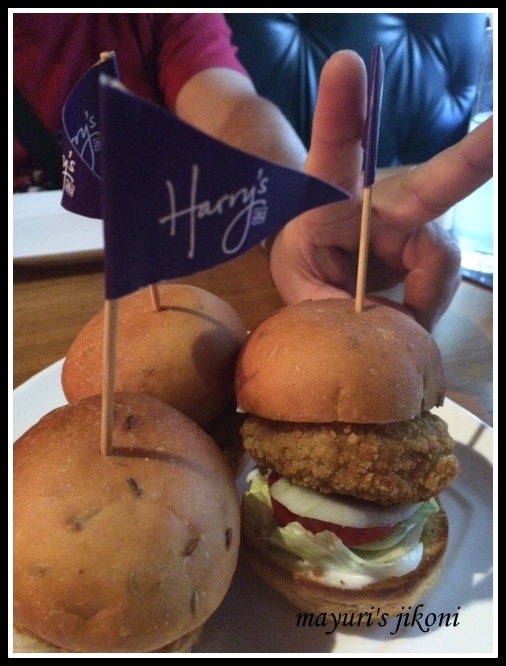 The second time round I ordered mini veg burgers which were good. However the fish ordered by hubby was just too oily and not fresh. The place is pricey but a cool place to get away from the heat. 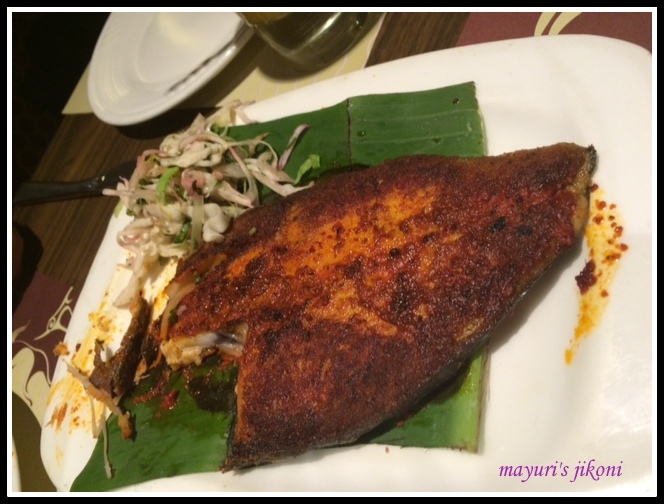 We went to the forgotten Mahesh, a fish speciality lunch house next to Marriot..Hubby has been there several times but it was my first time. I was a bit apprehensive as I thought, what am I going to get in a fish speciality restaurant. I was surprised at the extensive menu they have. The ambiance was wonderful, loved their place mats and the orange mojito was a satisfying drink. 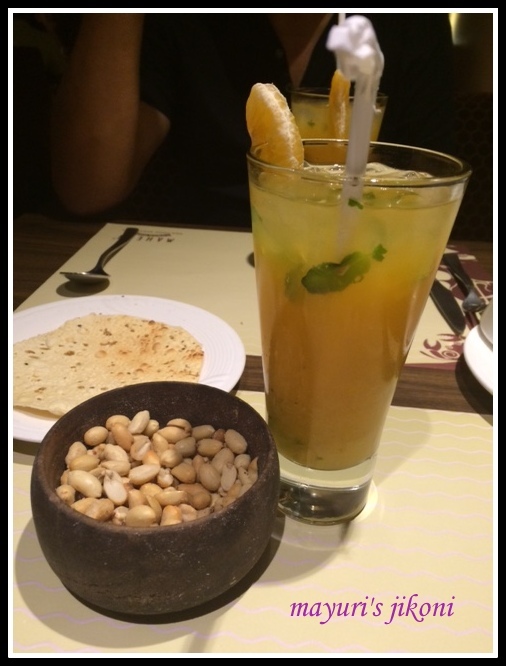 Roasted papads and peanuts are served with the drinks. Tandoori mushrooms, egg masala, lachcha parathas and surmai fish were well recommended dishes by the head waiter.Don’t miss a meal at this place especially if you love your sea food.They bring the fresh catch to your table before its cooked. I probably would never be able to eat it knowing that it was alive a few minutes ago! However for seafood fanatics its a thrill to see their food alive before its cooked. Vegetarians, they have a good choice of starters and main dishes for you. Temple Flower opposite St. Joseph Church is our all time favourite place. It serves Indian, Indo Chinese and Italian. The Italian dishes come from Alfredo situated in the same compound. We love the dim sums, spinach stuffed mushrooms, spring rolls. I always enjoy the tofu and veg along with either fried rice or noodles. Pastas are good but they could go a bit easy on the sauce.Not too expensive, its a place that will satisfy all. Another place to have unusual dishes is Silver Beach Cafe. It serves extra thin base pizzas with unusual toppings. Love the pastas and starters. Its a romantic place but do check out the chair before you sit on it! Places that we missed eating at this time round but have awesome food is Shiv Sagar and the small eateries on the beach. Hubby wouldn’t allow us to eat there but I’ve had meals there and not fallen sick. As tempting as the golas(frozen ice) are, its best to avoid them as we are not sure whether they really use filtered water. I could only convince hubby to take me there to have a delicious cooling pista kulfi. 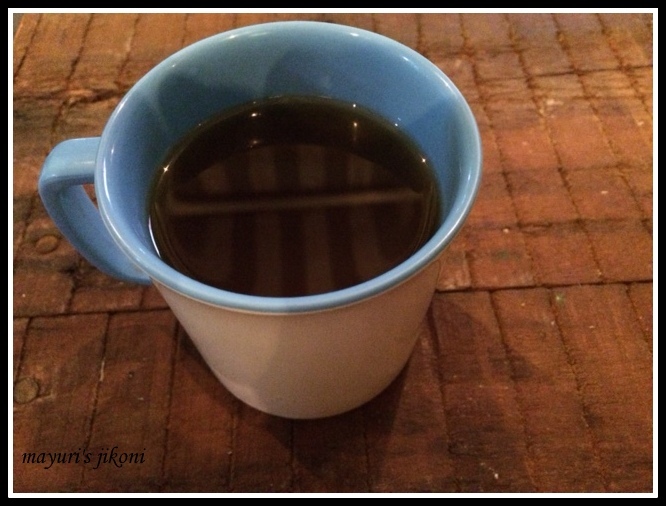 Yes, forget about the cough and cold. Must try the kulfis after a plateful of pav bhaji, ragda pattis or the machurians. The best place to have a cappuccino, latte, cold coffee are the Cafe Days situated near the temple and one at Shoppers Stop. Natural ice cream is the best ice cream. Some of the ice creams are available throughout the year like vanilla, chocolate and roasted almond but the rest are seasonal. This time we were fortunate enough to enjoy the fresh strawberry, custard apple and roasted almond ice creams. Their shop in Juhu is undergoing renovation. Do make a stop there to enjoy some cooling treats on a crispy crunchy cone or in a cup. Though you had lot of trouble with your luggage's but you had a nice time there I could make out from the snaps…Hope I was in Mumbai and I would have definitely tried all those lovely places to get verities of food…Congratulations to your daughter for the new beginning. Thanks Amrita. We did have a great time as the family was together. Looks like a nice places to visit. next time I will look into these places during my India trip. thanks Priya. Paper dosa is my hubby's favourite. definitely nice Swathi, do visit them when you are in Mumbai next time. 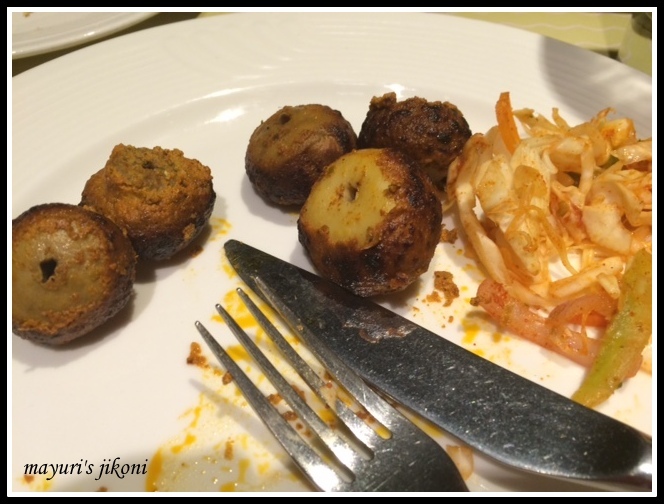 Didn't get to go to Dakshinayan, but had heard so much about it for South Indian food! Now that you've mentioned it here, I regret not making time to go there!